After three or four months, he loses his forehead stripes. Parakeets can live 10 to 15 years in captivity, so you two have a nice long time to get to know each other. If you aren't sure if your bird is a baby or an adult, certain clues will help you ballpark his age. Look at your parakeet's forehead. This is one of the most consistently telling methods of aging your bird. When a parakeet is about 3 or 4 months old, it molts for the first time. If your bird is younger than that, his head is adorned with stripes all the way from the forehead down the back of his neck. After his first molt, he loses the stripes from his forehead. Gaze deep into your parakeet's eyes. From birth until about 8 months, a parakeet's iris (the colored part) gradually lightens. 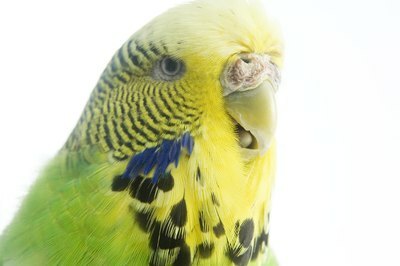 If your parakeet has all-black eyes, he is probably less than 4 months old. If he has a very light iris that distinctly contrasts with his pupil, he is at least 8 months old. Read his bling. If your parakeet came registered with an ID band around his leg, that can tell you exactly how old he is. Check the abbreviation letters on the band, as different organizations track years using different colors. For example, if the band says "ABS," the bird was banded by the American Budgerigar Society. Different ABS bands represent different years—for example, red bands signify 2012, while green bands represent 1998. While you are able to determine whether your parakeet is older or younger than 8 months or so, past that point aging is relatively inaccurate—the best you can hope for is an estimate, and only a veterinarian can give you that after an examination. These usual means of estimating a parakeet's age work for most varieties, but there are some exceptions. The lutino/albino and recessive pied varieties don't have the usual cap feather markings. Red-eyed varieties have pink irises regardless of age, and recessive pied and dark-eyed clear varieties always have eyes of a dark plum color. Lisa Shea: How Old Is My New Parakeet? Can a Parakeet and a Finch Be Housed Together? Why Do Parakeets Have Rings on Their Legs?